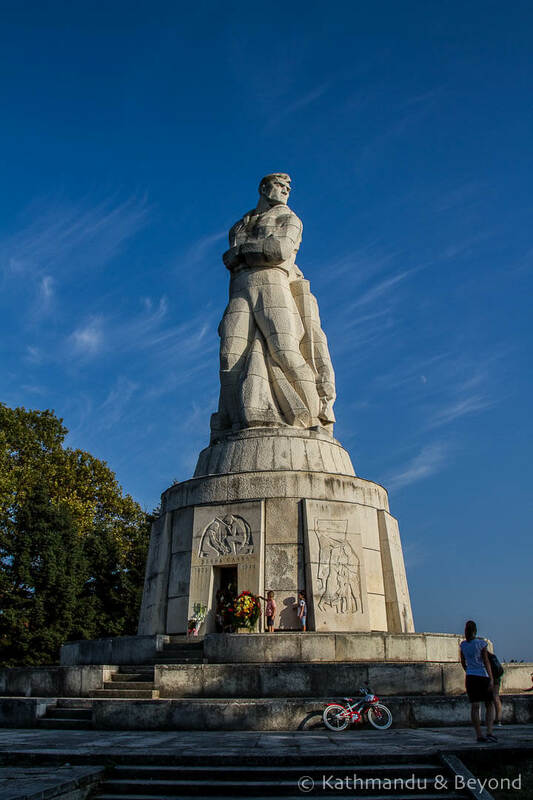 Situated in the port city of Varna, the Park-Monument of the Bulgarian-Soviet Friendship (hence forth referred to as ‘the Monument’) is one of Bulgaria’s most imposing Socialist-era relics. 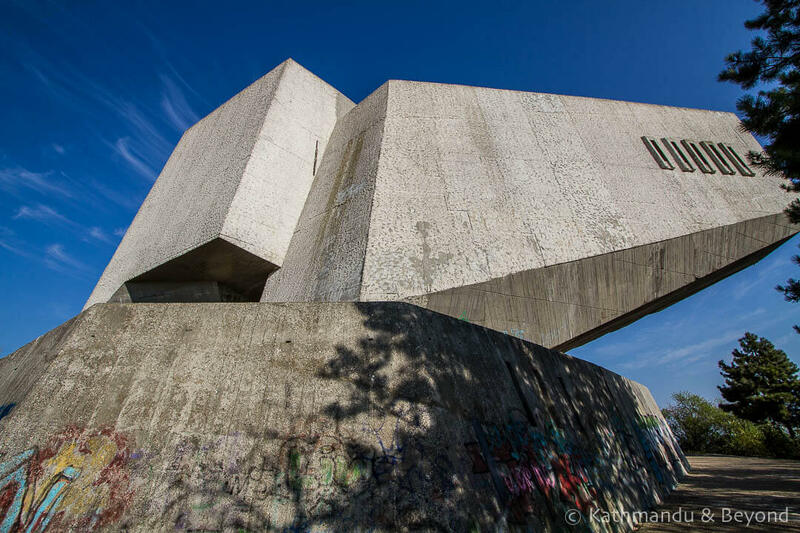 In fact, I’d go as far as to say that after the former Communist Party headquarters of Buzludzha and the ginormous Monument to 1300 Years of Bulgaria in Shumen it is the third best structure of its kind that I have seen in this underrated Balkan country. The Monument doesn’t have Buzludzha’s remote location or the spirit of adventure required in order to visit (*), and it isn’t as magnificent, size-wise, as the Monument to 1300 Years of Bulgaria but what it does have is a captivating history and an air of mystery about it which I personally think neither of the other two can match. 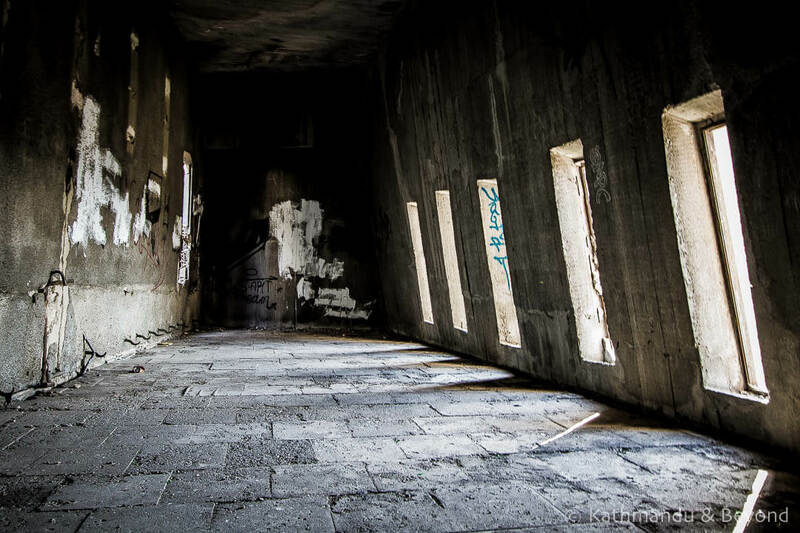 (*) Buzludzha is in the middle of nowhere and can’t be reached by public transport. Furthermore, getting inside this crumbling mausoleum to communism involves a bit of prior knowledge and an element of luck. As its name suggests, the Monument was created to honour comradeship between these two nations. Work started on the monument in 1974 and was completed five years later in 1978. Although relations between Bulgaria and Russia go back a number of centuries, the 1970s and ’80s was a period when the political and ideological bonds between both countries were probably at their strongest. During the Cold War, for example, under the leadership of Todor Zhivkov, Bulgaria became the Soviet Union’s closest ally in the Balkan region and although never a part of USSR, it did become a Soviet satellite state. Such events were of particular importance to the powers that be in Moscow because Yugoslavia, the Balkan’s largest communist country, went to great lengths to remain independent of Russian control. 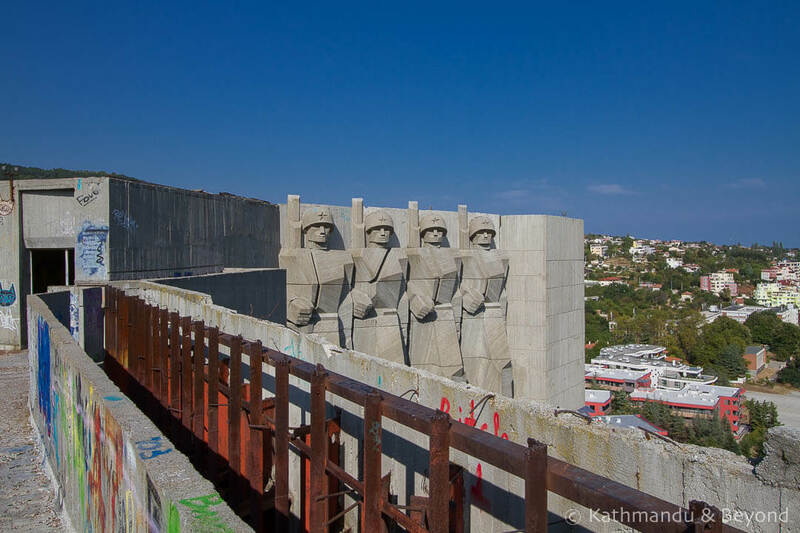 More specifically, the structure was erected to honour the Russian Army and the part it played during the Siege of Varna, part of the Russo-Turkish War of 1828-9. 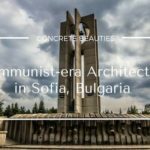 As with other memorials of its era in communist countries (Ukraine is another example), the initial concept began as a design competition, whereby architects and other specialists in the same fields (sculptors, engineers etc.) would submit their idea/plans to a panel of judges. In this instance, the judges were based in Sofia and this particular contract was awarded to a team of one architect (Kamen Goranov) and two sculptors (Alyosha Kafedzhiyski and Evgeni Baramov) and they were assisted by a total of 27,000 volunteers over the period it took them to eventually complete the project. 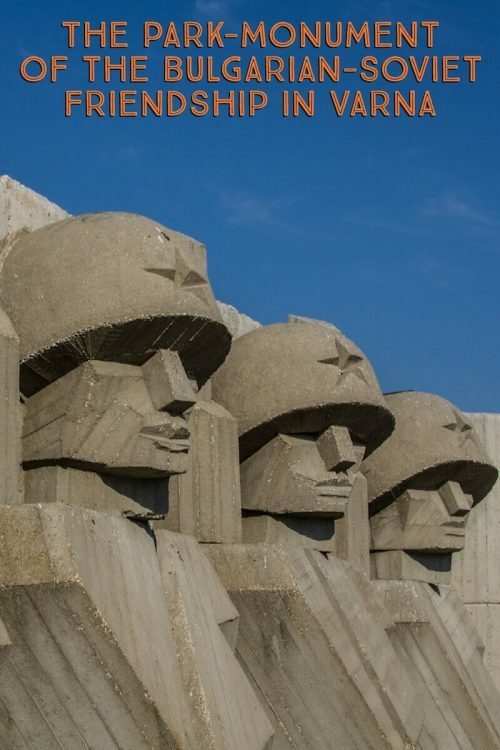 The Monument is situated in the northern part of Varna, on Crane Hill (Turna Tepe) which was the spot where the Russian forces were based during the above-mentioned siege. It resembles a pair of wings and looks out towards the Black Sea. When it was finally unveiled with great pomp and ceremony on 13th November 1978, it boasted a tourist information centre, an eternal flame, a gift shop and a bookstore. The area surrounding it was planted with more than 20,000 trees and shrubs and 301 steps (known as the Staircase of Victory) led up to it. 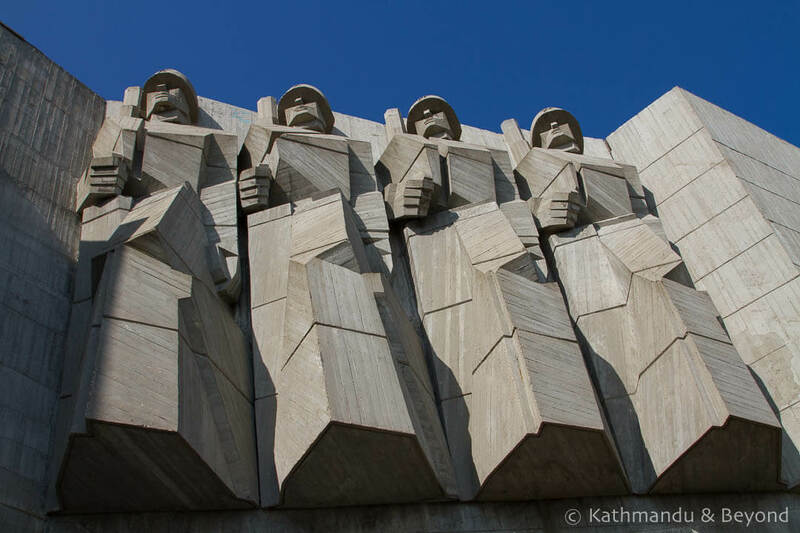 The four soldiers on the right of the monument are Soviet, while the three figures to the left are Bulgarian and female. Probably the most interesting detail about the Monument is the fact that underneath the hill on which it is situated there is a large Cold War bomb shelter and a network of concrete tunnels that, according to urban myth, extend to the coast and even further to strategic points in the city itself (5km away). 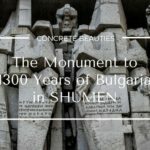 This was a period of almost feverish construction in Bulgaria when it came to colossal monoliths and the Monument was the largest of its kind in the Varna area. 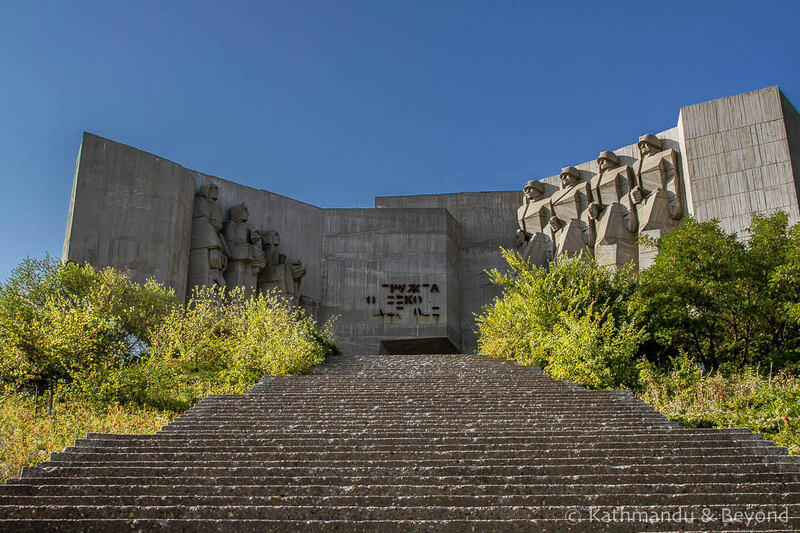 Like other communist-era vestiges from the same period, the Monument in Varna fell into a state of abandonment shortly after the fall of Bulgarian communism in the early 1990s. 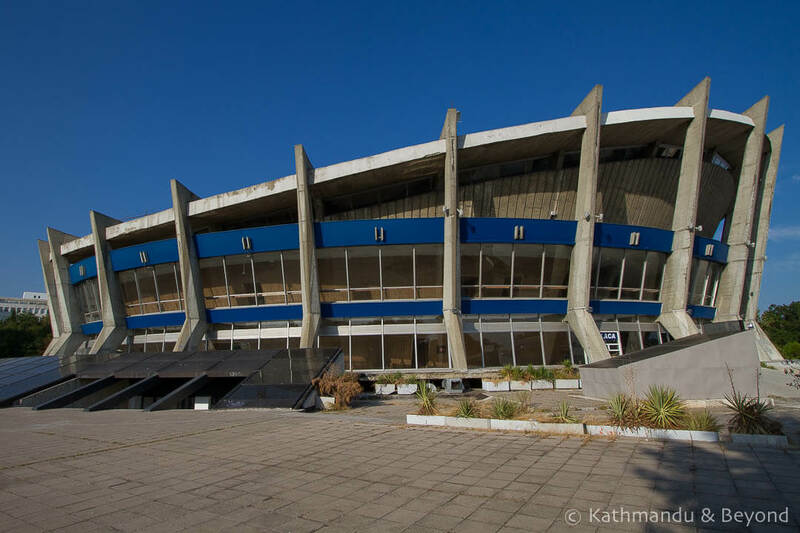 It didn’t take long for the vandals and thieves to move in and reduce it to a shadow of its former self and it remains in this sorry state to this day. Bulgaria looks towards Europe for its alliance these days (*) but it is doubtless nervous about antagonising Russia by demolishing such a structure completely so it stands on the outskirts of Varna; a popular place for fitness training for some (because of the stairs), somewhere to simply hang out for others, and an unconventional tourist attraction for curious visitors like ourselves. (*) The flagpole at the bottom of the stairs is reportedly the tallest in Europe. It used to display a Bulgarian and a Russian flag. These days the Bulgarian flag still flies high but the Russian one has been replaced by that of the European Union. Standing at the bottom of the Staircase of Victory, the first thing you notice as you start to climb the 301 steps is the monument’s unusual shape. Many of the memorials we have visited in Bulgaria are strange in their design but this is one is more abnormal than most, especially when viewed from the backside. Getting inside the Monument is simple enough. A large opening is located on the left-hand side of the entrance that passes through the two huge concrete wings. A little bit of clambering is required but nothing too arduous and once inside it’s a matter of following the stairway to the rooftop. It’s dark inside so carrying a touch is a good idea and along the route are various rooms and chambers that were once used as reception areas. 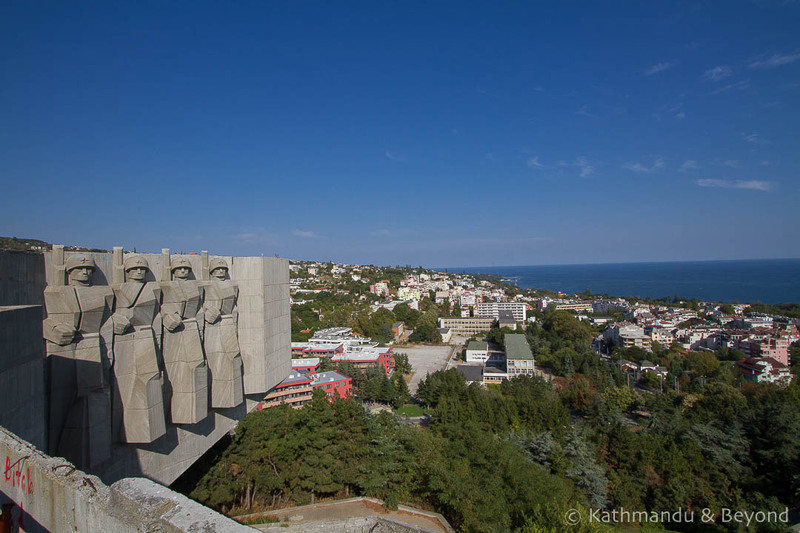 The view from the roof is terrific, with sprawling vistas of Varna and the Black Sea coast in both directions. Getting into the bunker beneath the monument is not as straightforward, however. Directly around the back of the memorial, there is an opening and an obvious staircase that seems to go forever, down and down into the darkness. And it is dark, very dark indeed and the only reward for reaching its natural end, apart from some unusual alien-like symbols on the walls, is a large steel door that is well and truly padlocked. 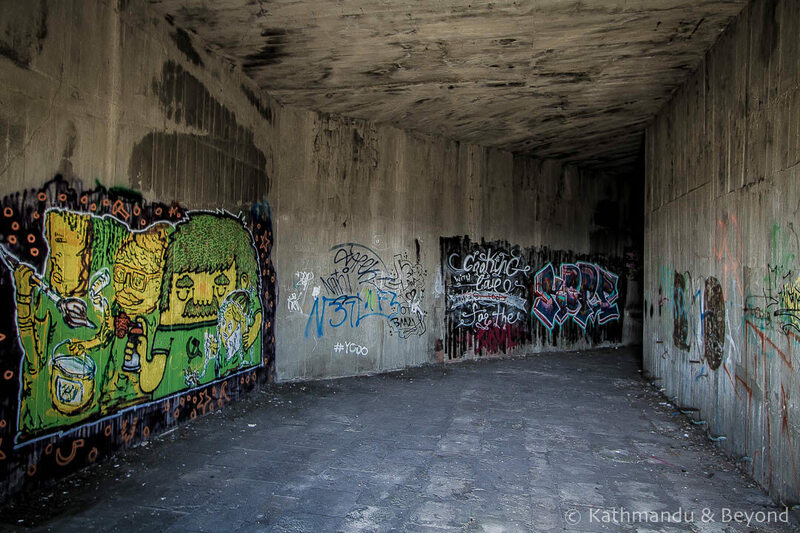 For the determined, it is possible to access both the bunker and the network of tunnels beneath this ageing hulk via another route but this is not something we attempted and so we can’t pass on any firsthand knowledge of how to go about it. 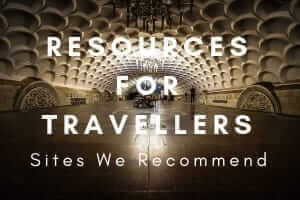 Googling it will yield some results and we’ve put it on our ‘to do’ list for the next time we are in the city. Assuming the sun is shining, from a photography point of view the morning is probably the best time to visit although, given the monument’s position, both times of day have their advantages and disadvantages. We visited in the afternoon and got some decent shots of the Soviet soldiers but it was tricky to get a full frontal view and photographing the three Bulgarian women was difficult as the sun was directly behind them. To get to the Monument (coordinates 43°13′08.31″N 27°56′56.27″E), take bus #148 from outside Varna’s Tourist Information Centre (opposite the Cathedral of the Assumption of the Virgin). The structure is about 5km east of the city centre and it is also possible to walk there via the pleasant Sea Garden/beach promenade. We took the bus all the way there but got off on the return journey at the Palace of Culture and Sports, an impressive building in its own right. From there we crossed the road and headed into the Sea Garden and walked back to the centre via the Pantheon and other places of interest in the park. DID YOU ENJOY THIS POST? WHY NOT PIN IT?